The troubled sequel (delayed almost a year) to 2009's "G.I. Joe: The Rise of the Cobra" is finally looking in tip-top shape with its latest trailer released by Paramount Pictures just a few hours ago. And yep, there was a jab on North Korea which we found subtle yet funny. Hopefully the re-writes, re-shoots and what-nots (forcibly adding 3D) won't make this hone on the same light as its predecessor. The G.I. Joe Team finds themselves "terminated" when Zartan, who is impersonating the President of the United States, frames all G.I. Joe operatives as traitors to the United States. Zartan now has all the world leaders under Cobra's control with their advanced warheads aimed at innocent populaces as hostages. Badly beaten and outnumbered, the remaining Joes make a desperate plan to overthrow Zartan and Cobra and take back the world with the help of the original G.I. Joe General Joseph "Joe" Colton (Bruce Willis). "G.I. 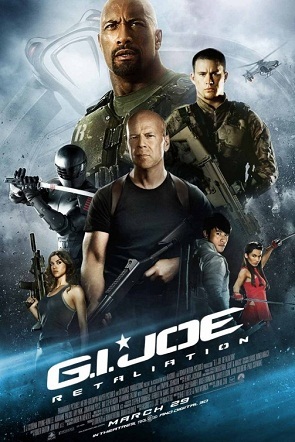 Joe: Retaliation" opens March 29, 2013. Catch the trailer after the break.